Matt returned home from vacation and hit the ground running. We’ve got several projects in the queue, and here’s one we’re focused on right now. It’s dangling hanging mobile for the flagship location of a bank in upstate New York. The mobile will hang 8 feet tall by 6 feet in diameter. The images below show the side view and view from beneath. We’re excited to see it come together! Here’s a series of mobiles we’re creating for a mall in Tulsa, Oklahoma. Each mobile hangs 12 feet tall by 12 feet tall, and they’ll hang over a new children’s play area within the mall. We’re installing in a few weeks, so stay tuned for updates! Here’s a rendering and final image of a mobile we created for a medical office in Pennsylvania. The mobile needed to cover a large space—22 feet tall by 10 feet wide—but stay within a strict budget. Using a straightfoward design and large, simple shapes, we were able to meet the challenge. The photograph shows how the shapes help fill the space nicely. Coming back to work after Thanksgiving break feels great when your inbox includes an e-mail from a happy client. 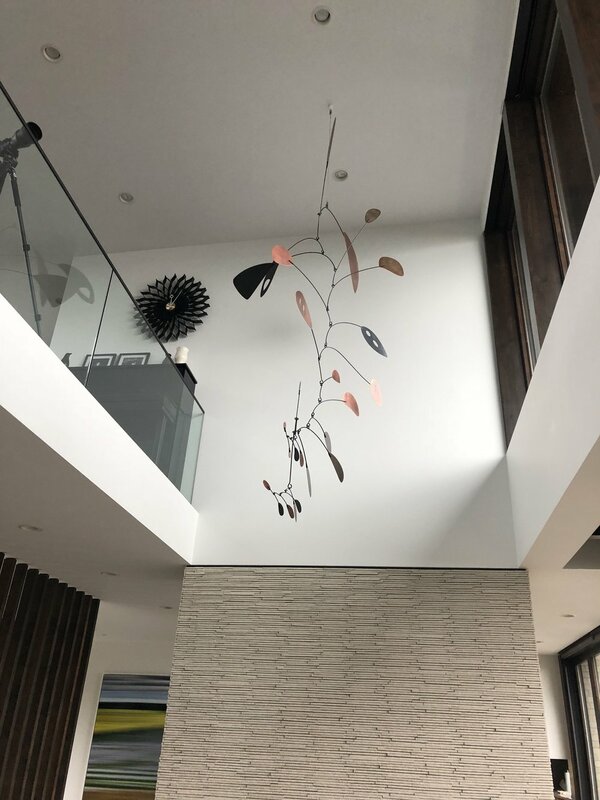 Below are pictures of the Copper Mobile we created for a (gorgeous!) private residence in Seattle. Ok, this is one of those projects where our contract with the client prohibits us from providing us much detail. But we can’t help but show this mock-up of this mobile in a mock-up of the space. And you’ll just have to believe us when we say it’s gonna be awesome. Here’s a hanging mobile we’re shipping to Kentucky for a bank’s atrium. Our main constraint with this project was to fill a relatively large space on a very specific budget. 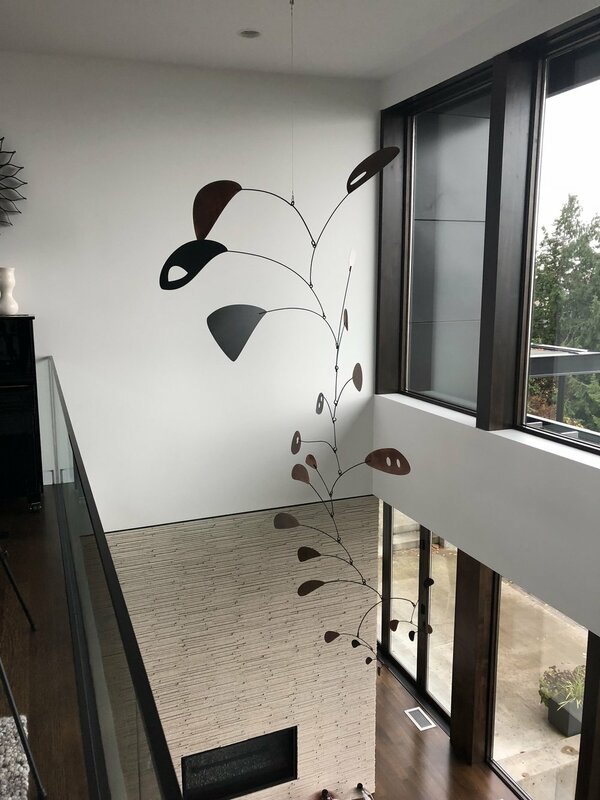 This piece hangs 8 feet by 10 feet tall, and it gives the client some serious bang for their buck. We've got a crazy-busy summer ahead. Here's one of the projects in our queue. It's a 42 foot tall mobile made of fabric stretched over metal frames (kind of like our White Ribbons project from many moons ago). Se'll try to squeeze in time to share updates, so stay tuned! 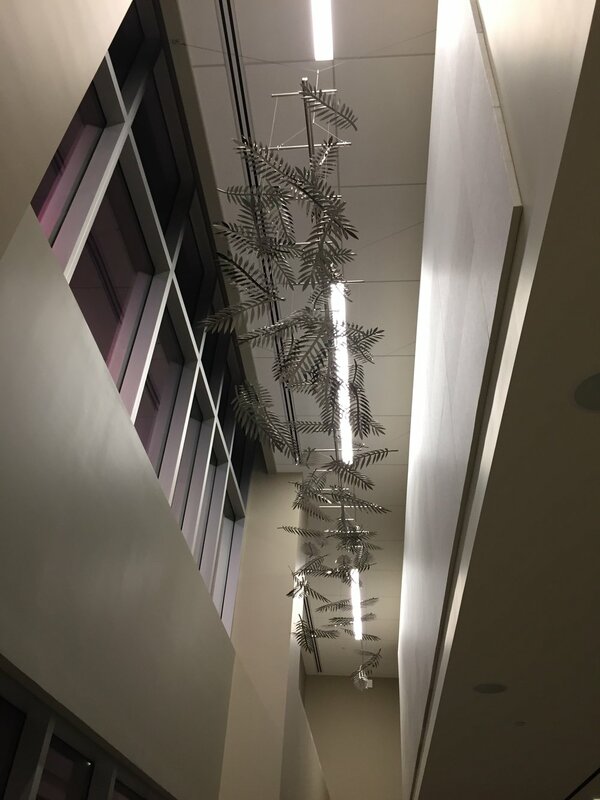 If you tilt your head, squint your eyes, and look past the clutter and white board notes and random cords hanging from the ceiling, you can see how nicely this mixed-material mobile turned out. We loved putting the laser cutter to work on this project! Matt traveled to Virginia last week to install the logo mobile. Isn't she lovely?